hangs beneath them. We haven’t spotted any with blue markings and since most of them we see are hanging from our ceiling or sitting on the table or the shelves we have no idea of their leaf preferences. They are supposed to eat aphids though so worth encouraging them. 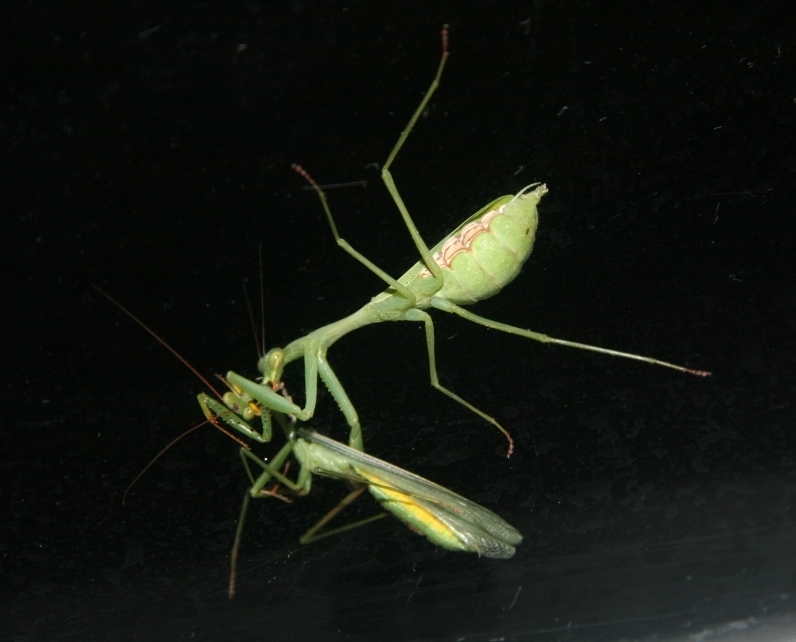 Anyway – the reason why I started writing tonight is to tell you the tale of our misplaced kindness to our friends the Praying Mantis and the dreadful repercussions that ensued. Earlier this evening one of the flat, long bodied variety flew on to my knee and so Nigel decided to put it outside, as he went out he spotted another PM of the fatter bodied variety on the window by the door so he kindly put them together. Since our curiosity had been aroused about the different shapes we looked at the websites and then went to look at our PMs to see if they had the blue markings on the fore legs. Imagine our horror when we found the long, flat bodied one in the jaws of the fatter bellied one! Too late for rescue we got the camera out and proceeded to document it’s demise! Attached are some of the photos – if anyone can shed any light onto the reasons for the different shapes please let us know! It may be, of course, that the flat bodied one is the male and the other the female, who is enjoying her post coital snackette!! 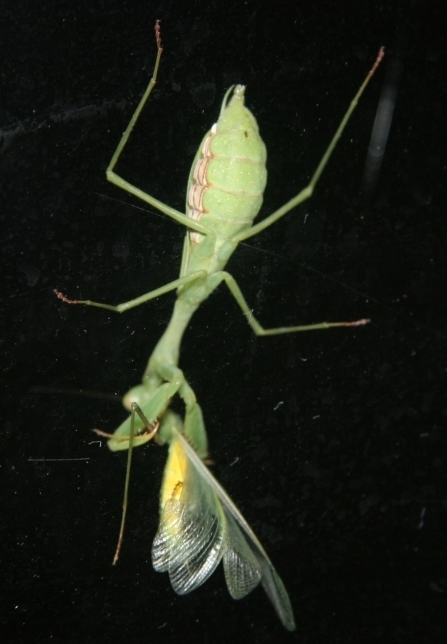 Posted on April 28, 2008 April 28, 2008 by robeannePosted in fauna, NZTagged insect, mantis, New Zealand Praying Mantis, praying_mantis. 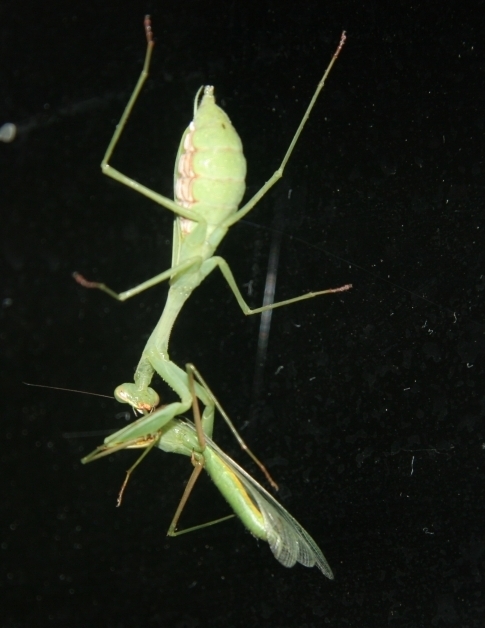 mantid, South African Praying Mantis. 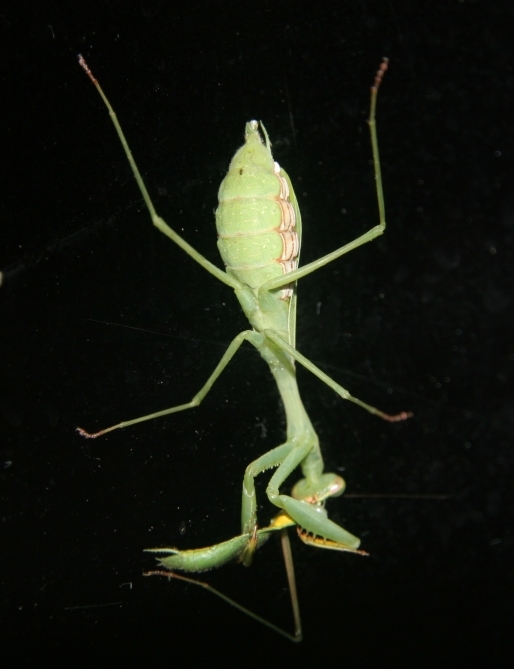 This ithe South African praying mantis which is quickly displacing our own NZ prayinging mantis and the occasional Australian praying mantis, Unfornutely the South Africans have a longer life are more hardy and have a much better sucess rate with their hatchings. And the fact that they hatch first means they are able to kill the NZ ones when hatch. The SA egg cases are different too being more round in shape starting off a soft green shade which changes to a soft pink. I would be surprised if the NZ mantis is still around in 25 years as the numbers of SA mantis increases at an alarming rate and I have certainly noticed here in Nelson the massive increase in them and sadly only 2 NZ and 1 Australia mantis were seen this summer. I myself kill as many SA mantis as I can but I feel it is a losing battle as well over 100 were killed on this property, my son finding a fat female only yesterday, the thin ones being the male. I didnt realize we had 2 types here and just now realize that its the SA variety that I have had living on my windowsill since it was tiny. Its now about 2.5cm long with no blue markings on its legs and gets a good diet of flies nymphs and anything else I feed it. The reason why Im here though is because today I found something that looked closely related to a praying mantis but was the colour of a pepper moth with much smaller head and forearms and walk with a rythm that can only be described as robotic, I have only ever seen one of these before in my life and wonder if anyone knows what it is or if it is a local? It also seemed to fly alot better than its green cousin which is how I missed out on getting a photo of it. 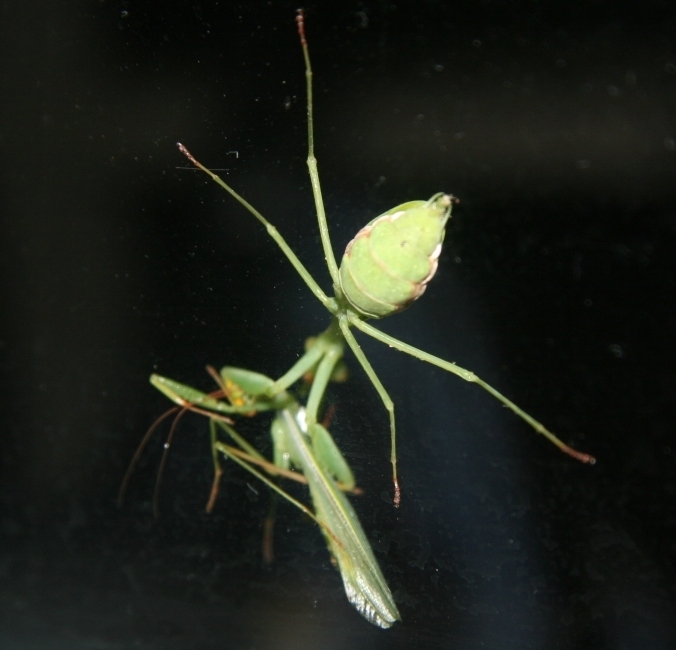 The praying mantis on my windowsill had no interest in eating it even though it was much smaller and ate a fly shortly after so she was definitely hungry. Any ideas? You’ll see the difference in both gender and species. 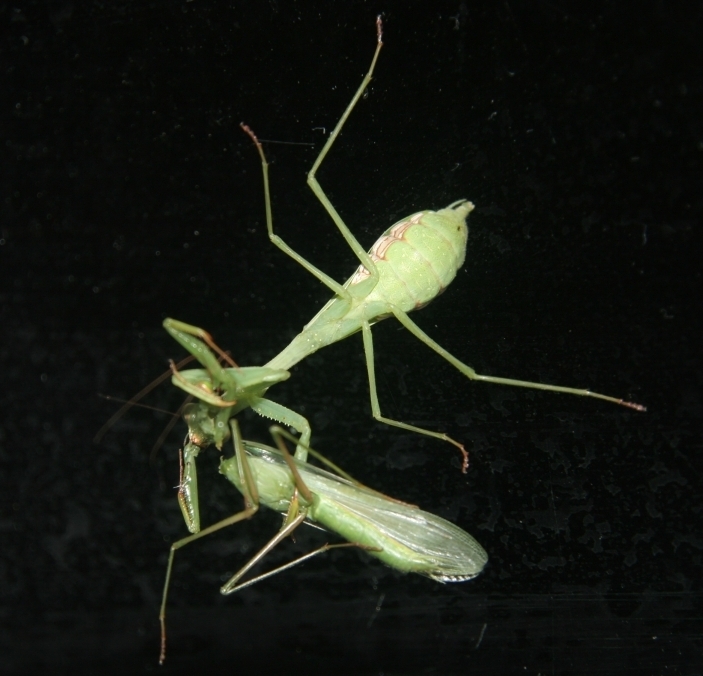 It looks like your ones here are both African mantis.